I wait until they are turning yellow before I pick them. Then I put them on the front porch to dry where it's quite warm. 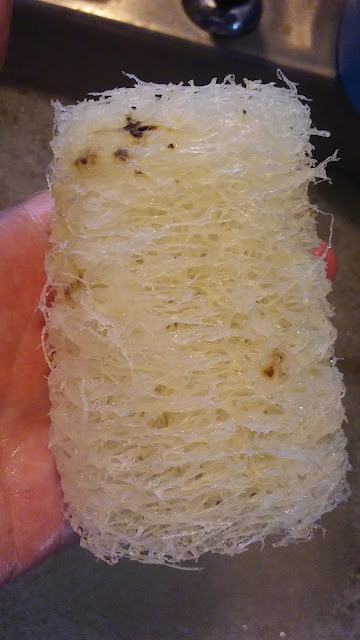 The first loofah I harvested eventually turned black. 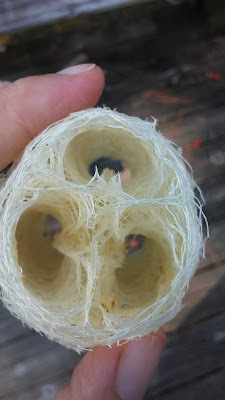 Then I cut the tip ends off and stripped all the husk and flesh off -- it's basically a very fibrous squash, and I'm trying to get down to just the fiber. That's the innards, the fiber, after I've let it dry for a couple of weeks. I shook its seeds out. Seeds from one loofah are more than I received in the one seed packet I ordered. 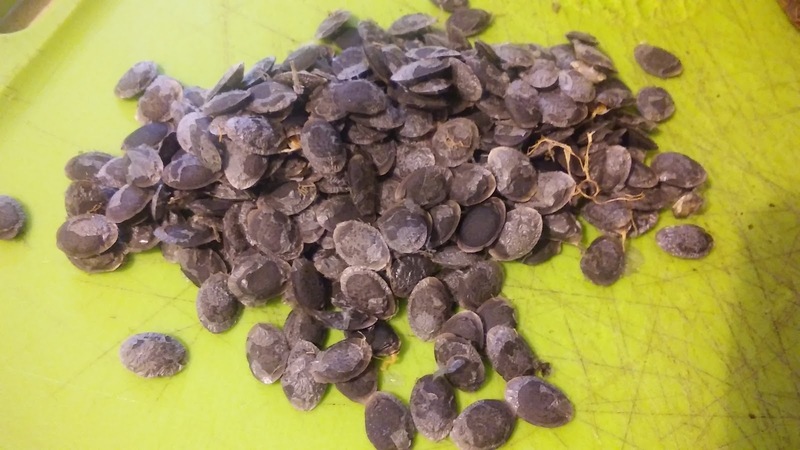 I'll never have to order seeds again! I then placed the dirty loofahs in a bowl with dish soap and bleach, and they soaked. See how they cleaned up? Above is the middle section that had the most dark flesh from the "fruit" stuck to it, and there are a few specks left, but I'll get it cleaned out. 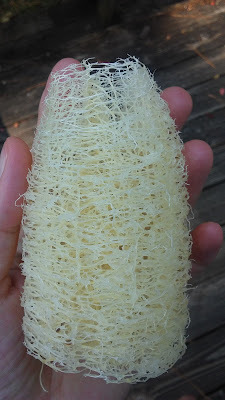 I plan to sell the loofah sections at the market, perhaps with a slim rope attached. Or I'll put them into a soap batch, selling the soap with the loofah cut right into it. 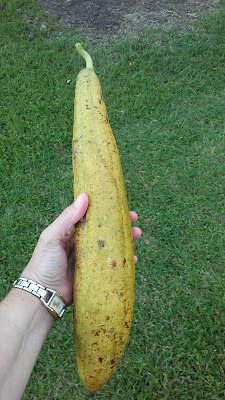 I've done that before, but not with loofah I've grown myself. And now, a few chicken pictures. These are my young birds. 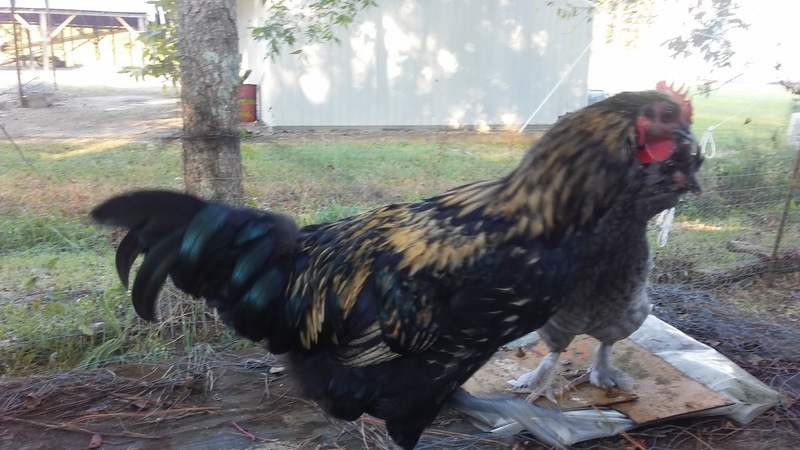 The dark one is the rooster, Arthur. Aren't Sylvie's tail feathers pretty? 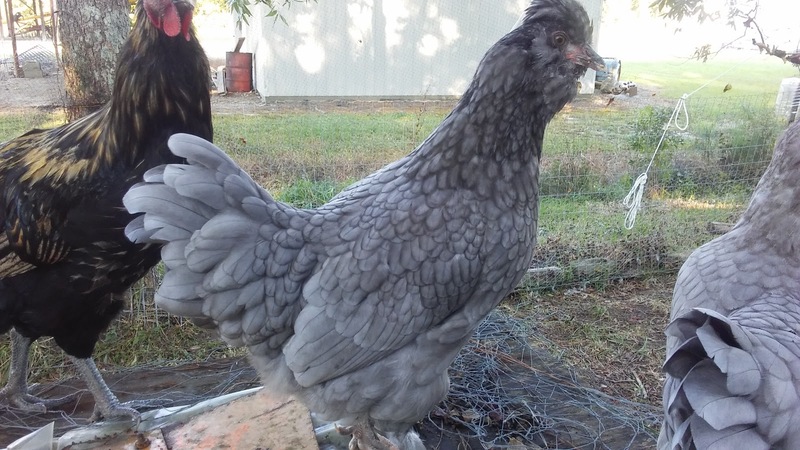 This is Lady Grey. 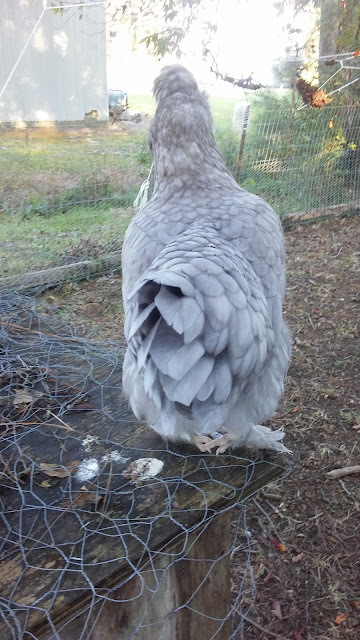 She's half silkie. Arthur is my friendliest bird ever. He comes quite close and seems to trust me. 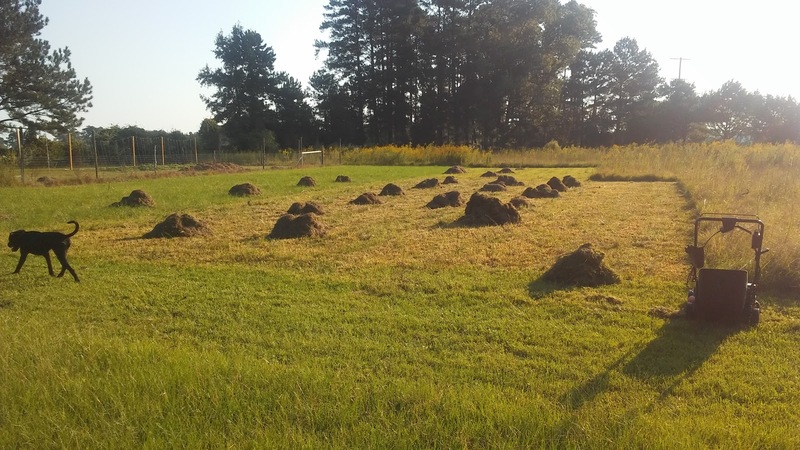 Each morning from about 8:00 till lunch, Adam is out in the big field, mowing the tall grasses down. He's making compost, as usual. Your loofahs are so nice. Seeds galore! I think they are nice for scrubbing in the shower or bath. 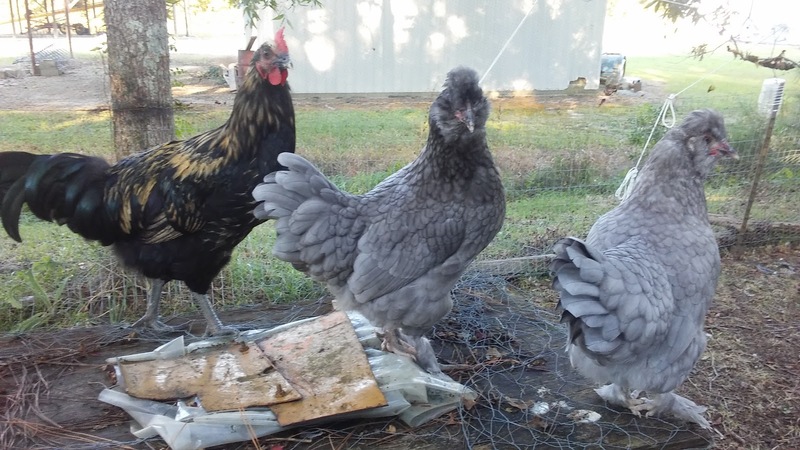 Your chickens are very pretty. These are the new ones, right? 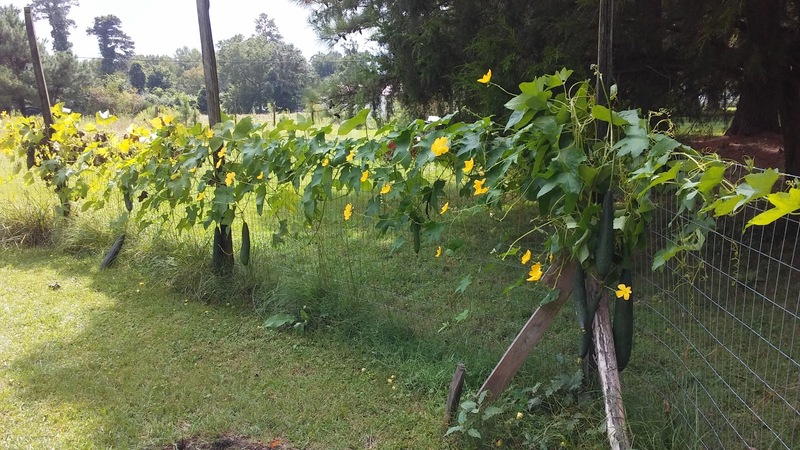 Your Fall gardening is going nicely. I'm still gardening too. We have not had a hard frost yet! Unusual. Love reading and seeing what is going on there at your farm. A delight. 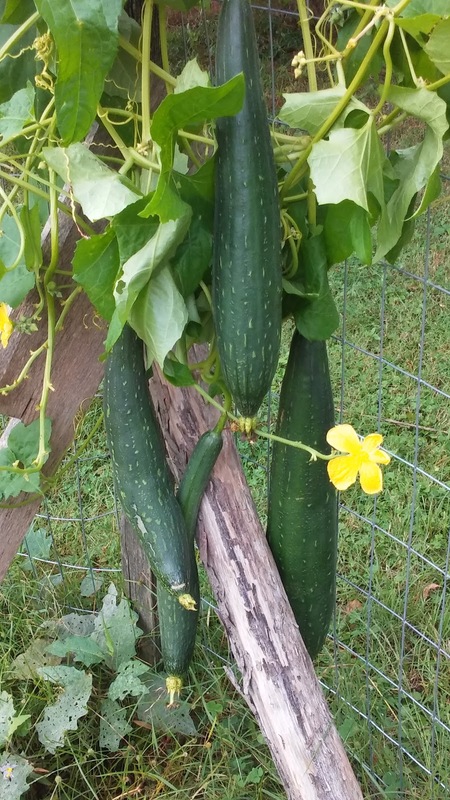 That loofa vine growing on the fence is so pretty, and 25 loofas! Seems like my mother planted some one year. 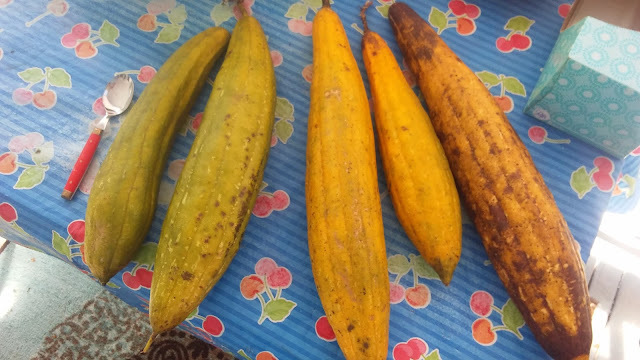 They almost look like zucchinis. I love your chickens too. We need to get a few new hens. Beautiful chickens! Love the gray. And very interesting about the loofas. I must add that to my garden next year. 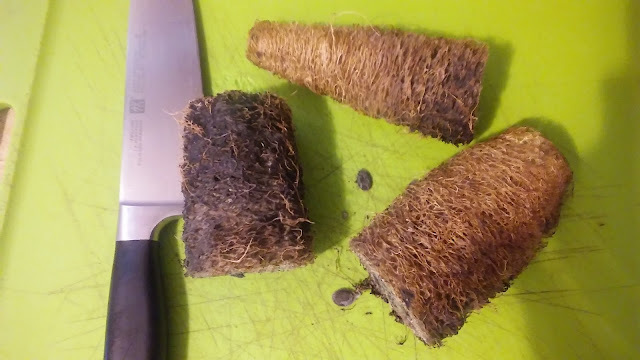 I could use some homegrown scrubbers. Love those loofahs. You sure had a successful crop of them. Great idea to sell them with the soap. Your chickens are very pretty. Don't think I've ever seen all gray ones like that. That is a huge mowing job. I will never complain about mine again! I love making compost. I managed to add some lovely rich compost to my borders this year and it was all free. Yay!